You do not need magic to walk on water, just some energy and good sense of fun! Let us introduce the all-time favorite activity of Siam Adventure Club: the “walk on water” activity. 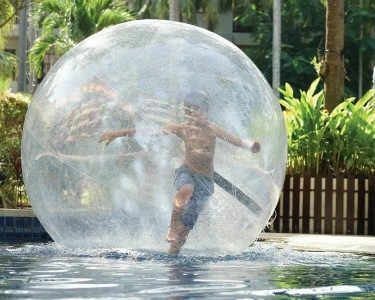 Kids enter in a large inflatable transparent sphere allowing them to walk across the surface of the water. Put your swimsuit on, jump inside the ball and walk, bounce roll over the swimming pool’s water.